1I had heard of Michel Fabre before I went to Texas. I was teaching Literary Studies at an Australian university, and I had read articles by him in Commonwealth and Kunapipi and World Literature Written in English. I liked the idea of this Frenchman working away in Paris, his bookcases full of writers from Australia, Mauritius, Trinidad, Nigeria. 2And then I went to Texas. I was in Austin, on a six-month sabbatical leave from Deakin University, Melbourne. I was writing a book of essays at the time, but I had a lost feeling. I’d just written a biography of the Australian expatriate writer Christina Stead, and to my astonishment, I was missing the obsessiveness of biography. One evening, at a party, a young African American with swinging dreadlocks and a rich Louisiana voice told me that Richard Wright had changed his life. The next day, I was browsing casually in a bookstore —I happened to be standing in front of the W’s, eyeing the Weltys and Whartons— when a colorful array of paperbacks caught my eye. I saw that several Richard Wright books had been re-issued by the Library of America in restored, unexpurgated editions. The previous evening’s conversation came back to me. 3One thing led to another, as is the way of serendipity. Pretty soon I was in the University of Texas library (richly endowed by oil money), looking up books about Wright and finding Michel Fabre’s name all over the place. I saw that Fabre had not only written Wright’s biography; there was a collection of his essays on Wright; he had produced a bibliography of Wright’s vast collection of books; he and Keneth Kinnamon had compiled a book of Wright’s interviews, and there was more. I went home with a pile of books, feeling humble. 6A number of things had me wriggling in my armchair as I read my way through that pile of books. The bleakness of the racism I saw around me in Texas shocked me. Then there was Wright’s powerfully visceral writing, which made me feel as if I myself were in the shoes of a black man in the Jim Crow South and Chicago in the 1920s and 30s. There was the inspiration of Wright’s life —his courage, determination, and sheer awe-inspiring talent which led to his long journey from Mississippi to Chicago, New York, and Paris. On top of this, there was the picture in my mind of Fabre the intrepid outsider, who battled on, despite the disdain the academy showed towards Wright, and despite the difficulty of working on a black man at a time when racial tensions in this country were broiling. I kept getting up from my books, and striding up and down the room, talking to myself. 8From Texas, I wrote to Michel Fabre, and sent him my biography of Christina Stead. A couple of weeks later, I followed up, as I told him I would, with a phonecall. I worried that he might think I was trying to usurp his place as a Wright biographer. I needn’t have. He said he would be happy to see me in Paris, on my way back to Australia. February? That was fine. 9Michel and Geneviève Fabre live on a winding cobbled lane, five minutes from the Montsouris Park in the South of Paris. You feel as if you’re in a village in Normandy; I half expected a herd of cows to come sauntering along. You walk through the iron gate, and stand in the pocket handkerchief front garden. The front door is surrounded by creeping plants. The house is tall and narrow, dominated by a spiral staircase that winds its way to a kind of Rapunzel’s tower at the top. That’s Geneviève’s office. Michel’s, one floor down, is full to bursting point with books, filing cabinets, files and folders. His library must surely be the best collection of African American literature in the whole of France. 10Michel Fabre is not a pushy man. He’s not even assertive. But he’s quietly encouraging. He sensed that I was feeling defensive about my own hubris, and told me he knew nothing when he started out on his Wright quest. “You have to start somewhere, and what better way to start than with curiosity, passion?” We talked for several hours, and established, among other things, that we were both Scorpios. To inspire me, he gave me a CD, Trois Américains à Paris, on which Richard Wright speaks French like a Mississippian, James Baldwin speaks French like a Frenchman, and Chester Himes (who never learnt French) speaks English. 11I returned to Australia in buoyant spirits and set to work. Four months later, in June, I hit an all-time low. I was back in Paris. Ellen Wright, in our interviews, didn’t seem to remember anything much. I’d spent a week in the close company of an African American friend, whose view was that the US was divided into two worlds (one black, one white) and protecting each from the other were high barbwire fences, vicious Alsatian dogs, and “Keep Out” signs. She told me that blacks would not like my book (since I am white), and whites were not interested in black subject matter anyway. The night before I went to Fabre’s, I re-read Wright’s novel, Savage Holiday, a facile Freudian novel (I’ve never liked this book) which culminates in the male protagonist stabbing a woman in her stomach, again and again, with a kitchen knife. I wondered what I was doing with Richard Wright. 12The next day, Monday 19 June 1995, I went to Michel Fabre’s and sat at his desk on the ground floor while he worked in his office upstairs. It was hot, and flies were buzzing around the room. Michel had been generous enough to let me see his files, and I was perusing the dozens of letters he wrote to people in Mississippi and Chicago asking for information, their handwritten replies, the post-publication letters from people arguing with details in his biography. The letters were mostly about minor details, and I was reminded that writing a biography is hard, obsessive work. You write letters asking questions, letters asking for interviews, letters thanking interviewees, letters that never get answered. Most of this material doesn’t go in the book. Suddenly I felt quite overwhelmed by the sheer immensity of the task. 14At lunchtime I told Michel Fabre that I’d decided not to go ahead with a Wright biography. He didn’t look surprised. He didn’t try to persuade me otherwise. He listened. He understood. He said yes, it was a huge commitment. He agreed that maybe identity politics had made it harder for whites to write about black subject matter. 16I returned to his house the following summer to examine those files. I was disappointed that Fabre hadn’t made written notes when he interviewed people on the Wright trail. But I was grateful for the many things Fabre did save for posterity. Because Fabre wrote to her, we have two wonderfully long and colorful letters from Jane Newton, describing what it was like to live in the same house as Wright when he was writing Native Son. And the only reason we have Wright’s unusually revealing letters to his Dutch friend and translator, Margrit de Sablonière, was that Fabre thought to type up copies. (Remember those days before photocopy machines?) Sablonière destroyed the originals. 17With typical generosity of spirit, Michel Fabre put me on to various people, including Celia Hornung, Wright’s last girlfriend, who lives in Melbourne, Australia. We did not communicate often (he was busy and so was I) but throughout the long haul, he was always there for me if I needed him. 18What makes Michel Fabre’s helpfulness to other scholars even more admirable is that he has not been well these past years. He has Parkinson’s disease, which makes it difficult for him to travel alone. His eyes are deteriorating, which makes it hard for him to read. Never once have I heard him complain. “My health is holding up,” he will say. “I’m fine.” He continues to travel, to stride around the Montsouris Park, to read and write prolifically. ROWLEY, Hazel. 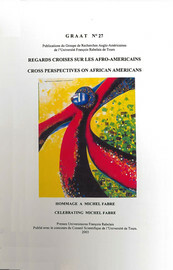 Fellow Scorpios In : Regards croisés sur les Afro-Américains : Mélange en l'honneur de Michel Fabre [en ligne]. Tours : Presses universitaires François-Rabelais, 2003 (généré le 19 avril 2019). Disponible sur Internet : <http://books.openedition.org/pufr/4180>. ISBN : 9782869064690. DOI : 10.4000/books.pufr.4180. Rowley, Hazel. “Fellow Scorpios”. Julien, Claude. Regards croisés sur les Afro-Américains : Mélange en l'honneur de Michel Fabre. Tours : Presses universitaires François-Rabelais, 2003. (pp. 157-160) Web. <http://books.openedition.org/pufr/4180>.